SEATTLE--(BUSINESS WIRE)--Apr. 13, 2016-- (NASDAQ: AMZN)—Eight years ago, Amazon introduced Kindle, making it possible for the first time to think of any book and start reading it in seconds. Since then, Amazon has introduced new Kindle e-readers that are smaller, lighter, and faster—all on a mission to make the device disappear so you can lose yourself in an author’s story. Today, Amazon took another step toward this mission: introducing Kindle Oasis—the eighth generation of Kindle—crafted from the ground up for readers, with an all-new, incredibly thin and light design, plus an included charging cover that delivers months of battery life. Kindle Oasis is available for pre-order today for $289.99 and will start shipping in the coming weeks. Meet Kindle Oasis at www.amazon.com/kindleoasis. Kindle Oasis introduces a new dual-battery system—as soon as you connect the cover to Kindle Oasis, the battery in the cover begins recharging Kindle Oasis automatically. The battery in the cover uses a custom cell architecture that optimizes power and energy while keeping an incredibly small and light form factor and delivering months of battery life. You can charge the device and cover simultaneously while both are snapped together and plugged in. Plus, a new hibernation mode minimizes power consumption when your Kindle is inactive. Kindle, our most affordable reader, with a touchscreen display and all the latest features customers love about Kindle, including Whispersync, Smart Lookup, and Goodreads integration, just $79.99. Kindle Paperwhite, the most popular and best-selling Kindle, features a high-resolution display and an adjustable front light, just $119.99. Kindle Voyage, with a high resolution, high contrast display, an adaptive front light and page turns with PagePress buttons, just $199.99. 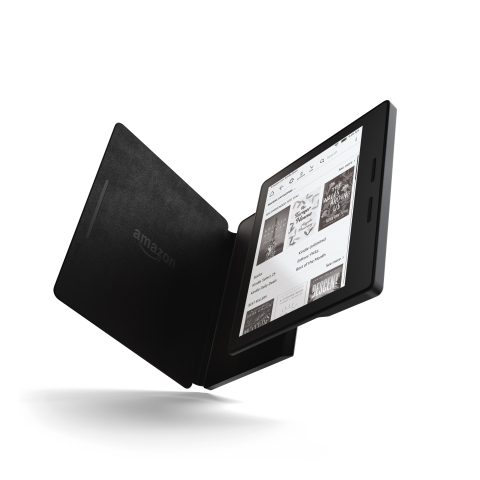 Kindle Oasis, the thinnest and lightest Kindle, with an all-new ergonomic design, page turn buttons, and an included leather charging cover which, when added, provides months of battery life through a unique dual-battery charging system, just $289.99. Reads like a book—Thanks to a built-in front light, read without eyestrain or glare, even in bright sunlight. No set-up required—Kindle arrives pre-registered so you can start reading immediately. Family Library—With Kindle and Kindle reading apps, you can access not only your own books, but also books from the Amazon account of a spouse or partner. Kindle FreeTime—Gives parents a simple, engaging way to encourage kids to spend more time reading. Hand-select books for your kids to read, and achievement badges are earned when they hit reading milestones. Custom-Built Typesetting Engine—Word and character spacing, with hyphenation, justification, ligatures, and kerning lays out the pages just as the author intended. Kindle exclusives—Over 1,000,000 books are exclusive to the Kindle Store. Kindle Unlimited—Enjoy unlimited reading of over 1,000,000 books and unlimited listening to a selection of thousands of audiobooks for just $9.99 a month. Kindle First—Access new Kindle books a month in advance of their official release date. Customers can choose one of the featured books each month for $1.99, and Prime members can make their selection for free—yet another benefit of Prime membership. The new Kindle Oasis is $289.99. It is available for pre-order around the world and will start shipping in the coming weeks. Order now at www.amazon.com/kindleoasis.